A lot of news broke out from the air tight vault that is Nintendo this morning. Company President, Saturo Iwata (the mind behind the Nintendo DS and the Wii) revealed a plethora of news for owners of Nintendo products, beginning with an announcement of two Software Updates for the Wii U in the spring and the summer, and the launch of the Wii U Virtual Console, which, so far, has only been revealed to support Nintendo Entertainment System, Super Nintendo and Game Boy Advance titles. 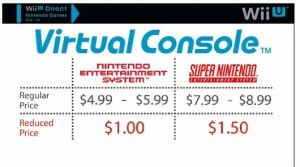 But what if you don’t want to pay for your Virtual Console games all over again? Not to worry! Iwata revealed that people who were good Nintendo fans over the course of the Wii’s lifespan will only need to pay $1.00 for the Wii U version of NES games, and $1.50 for Super NES games instead of $5.99 to $8.99. Also, to celebrate the 30th Anniversary of the Famicom (the original Japanese version of the NES), Nintendo wants to thanks it’s fans by having one game each month reduced in price throughout the year, leading up to July. Each month’s title will be available to Wii U owners for 30 days for 30 cents apiece. If you happen to own a Wii U and have never played these games, they’re all classics and deserve to be played even after all this time (Except for Yoshi, it’s awful now). But we don’t care about old games, right? We want to play new games! So, what was the biggest news from the Nintendo this morning? An HD Version of The Legend of Zelda: The Wind Waker! Wait. The biggest news was an HD version of an old game? Technically, yes. Since Nintendo revealed a High Definition demo of what Zelda could potentially look like on Wii U at E3 2011, people went almost as crazy as they did when the GameCube was revealed at SpaceWorld 2000, where people were teased to what Zelda could have looked like on the GCN. Some of you may remember that exciting prospect. Compared to what the Nintendo 64 could handle, people were expecting a gritty realistic looking Zelda game on the GameCube. Instead we got the friendly, cell-shaded Wind Waker. The announcement was completely unexpected when Wind Waker was revealed well over ten years ago. Nintendo was trying to move in a direction that would later become more realized in the Wii. The company believed strongly that making their games fun, and having solid gameplay, could be more memorable to players than the prettiest graphics imaginable. They were mostly right. 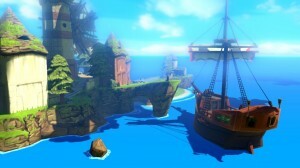 Wind Waker thrived in the hearts and minds of GameCube owners, and while Nintendo finally made the gritty Zelda everyone was begging for with Twilight Princess in 2006, people still prefer the charming cartoon Link and sailing over the ocean to this day, and the game is considered by many to be more “timeless” than Ocarina of Time, given it’s visual style. Today things are a little different. Nintendo tried to prove the power of gameplay over graphics again with the Wii, but developers were unsure of what to do with motion controls, leaving the only quality games for the system to be made by Nintendo itself. While Wii’s were occasionally being dusted off for good first party titles, people were playing games with superior processing power, online play, and 1080p visuals on the Xbox 360 and the PlayStation 3. So, Nintendo created the Wii U to play catchup, and they have a lot to catch up on while still playing their own “game” for lack of a better term. So it’s a little ironic that Nintendo would take one of their more memorable efforts in proving that gameplay can be more important than graphics and convert it to a High Definition port. It’s also surprising that the fans have reacted to this pleasantly, considering that Nintendo also did this exact same conversion process for Ocarina on the 3DS in 2011. Specifically in reference to to the order that dungeons in a Zelda game are played, which has not exactly been done since the original in 1985 on the NES. This was something the team tried to play with in Skyward Sword on the Wii, shaking up the gameplay style by having players revisit dungeons they’ve already completed for specific tasks, or drastically changing the worlds when they are returned to. Aonuma also mentioned a hint that implies they’re consideration of a more refined multiplayer in their new title. So where did this HD Wind Waker come from? 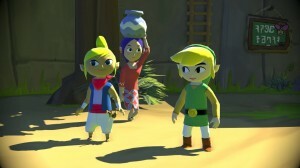 After the Wii U test footage from E3 2011, Aonuma and the team tried to “go back to basics and create a newborn Zelda so players can enjoy the real essence of the franchise.” And since the Wii U is Nintendo’s first outing with High Definition, the developer team “tried converting past Zelda art styles to find considerations in graphic styles for their new title.” These images of an HD Wind Waker are the result of that experiment, and because Nintendo believe themselves to be perfectionists, they want to take their time to reinvent Zelda for Wii U, but also give the fans something more while they work on it. 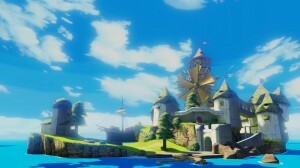 They will be converting Wind Waker into a High Definition port for the Wii U with entirely revamped visuals, ability to play on the television or on the GamePad, compatibility with MiiVerse and, as Iwata described “a tuned up experience.” Though it was not revealed, Wind Waker HD seems to have enough differences in visuals and changed features to be a disc based release as opposed to availability for download on the Virtual Console. So, with a revamped favorite coming in the Fall and an entirely new title in the franchise that looks to be a re-imagining of the series, Zelda fans have a lot to be excited about. This may also be seen as sour, or great news for followers of Operation Moonfall, as this could mean Nintendo isn’t focusing on Zelda on the 3DS at this point, or they simply don’t like Majora’s Mask in consideration of the fact it was made on a bet 15 years ago. If you have thoughts on this or other Nintendo material sound off in the comments below.